After the successes of 2004 and 2005, what could we do to develop our display, to give it a new dimension of interest? 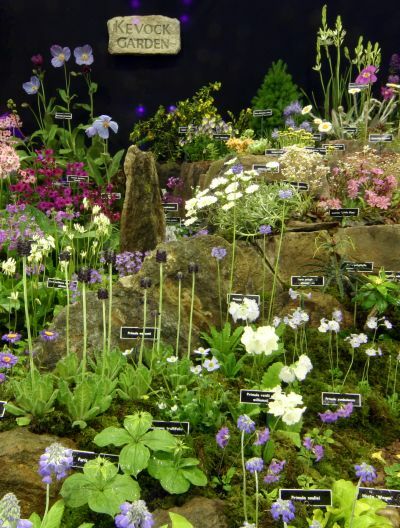 Could we put alpine plants, which are generally small, behind primulas, which are larger? Only by making the alpine area sit on high rocks. So off we went to our friends' stone heap in Aberfeldy, returning with some wonderful large slabs of rock, as well a an unexpected bonus, a few long, narrow pieces. 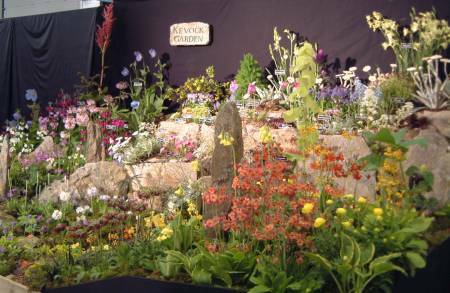 To the back right of the display we built the 'mountain', faced with large stones to represent cliffs, and on the top went the large alpine plants - a geographically unlikely collection of Celmisia, Scilla, Camassias, Daphne and many others. The smaller alpines then went to front left, and the rocky diagonal was completed with a few more large stones, and most of the monoliths, or standing stones. 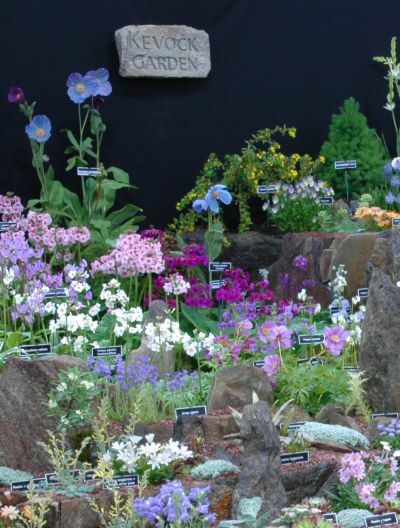 To the back left went Meconopsis, and a range of red, pink, white and purple Primula, with Cortusa, Dodecatheon, and ferns, Hostas and various other foliage plants to give space. The oranges and yellows were then front right, on a hill that rose to the front, capped by our first-ever flowering Rheum alexandre and one more standing stone. 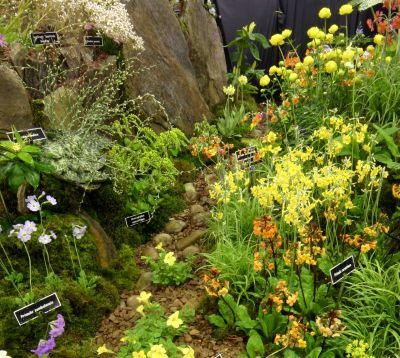 A river bed ran at the base of the cliff, but to see parts of this you had to go to the side of the exhibit, and look along, behind the bright Primulas and Trollius. Over three days it came together, as Jane, Stella and David placed plants, propped the props, plugged the gaps, and argued over what should go where, while others in the team helped in all sorts of ways. Somehow it worked. 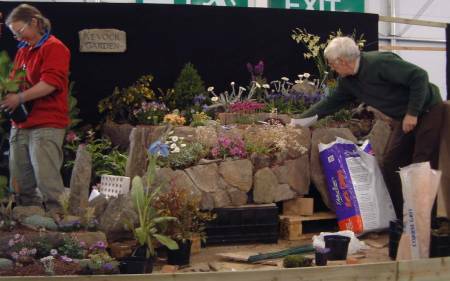 We were pleased with our efforts, and hoped to gain another gold medal and the Alf Evans Award for the best commercial alpine display. 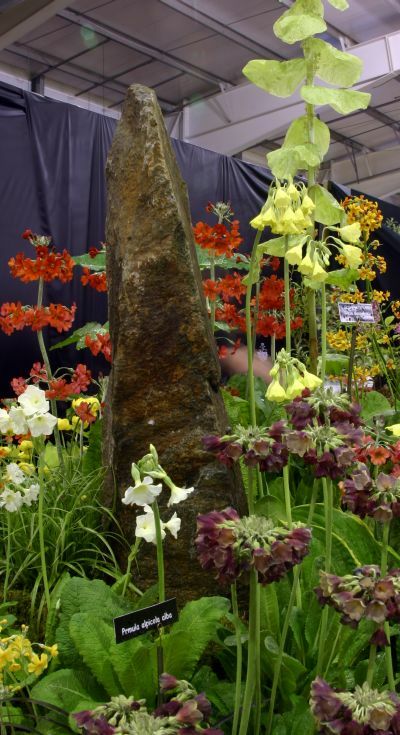 What we were not prepared for was the award for the best display of plants in the entire show - followed by many kind and appreciative comments over the three days of the show. Thank you all for your support and encouragement. Where do we go from here? We don't know, but there are a few sketches on a piece of paper. Maybe another trip to Aberfeldy? Here are a few pictures of the preparation and the display. Jane and David working on the display at Ingliston. 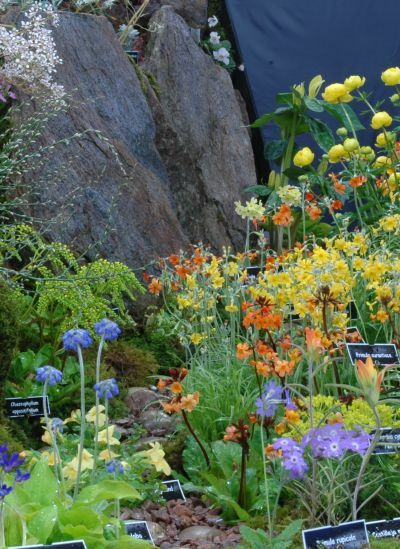 Meconopsis, primulas and some alpines. Primulas below a rock face. Rheum alexandrae and the dark red Primula sikkimensis. More primulas along a damp, mossy valley. 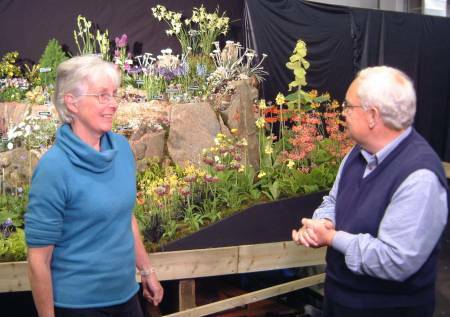 Stella and Jim McColl of Beechgrove Garden talking about the beginnings of our love of alpine plants.